Once you’ve gotten engaged and planned most of the wedding in detail, it’s most likely time to start thinking about wedding bands and the type of style you might be interested in. You’ve probably spent some time contemplating what you’d like your ring to be made of and how you want it to look, but keep in mind that there is one more important aspect to consider: how you want it to feel. A lot of individuals don’t even realize that rings actually come in different fits; they assume that the standard, uncomfortable straight-fit interior is just the way that all rings are made, and that they’ll simply have to make do with it. Fortunately, that isn’t the case. 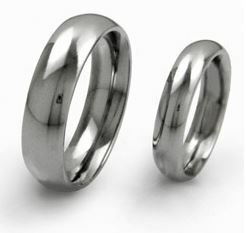 At Avant Garde Jewelry, all titanium and tungsten wedding rings come with the comfort fit feature at no extra charge. So what exactly is the comfort fit feature, you ask? Well as the name would suggest, it is a particular shape of the ring’s interior that makes it much more comfortable for continuous wear. Instead of the straight, flat shape of most standard rings, the comfort fit ring is crafted using extra metal to make the interior slightly rounded. For men in particular, the comfort fit has proven to be the best option for wedding bands because it is easier to squeeze over the knuckle and there is no pinching. Also, due to the fact that the thickest part of the band is at the center, as opposed to the uniform sizing from one side to the other in standard fit interiors, the edges of a comfort fit ring will feel slightly larger at the ends. This will help to make you feel as though you have some breathing room. At Avant Garde Jewelry, we care about the inside of your ring as much as the outside. Like the marriage itself, the wedding ring that you choose is one you need to be committed to every day from the minute you say “I do” forward. That’s why you’ll find that the attention we pay to the inside of each of our rings is second to none. Every order comes with a sizing set, allowing our customers to make sure that the ring size is absolutely perfect. What’s even more, we take the time to polish every ring one more time after the engraving to ensure that it is completely smooth and up to the high Avant Garde standards. Feel the comfort fit difference for yourself; browse our inventory and place your order today!